“Are we going to Basque country or are we going to Rioja?” I tapped back. When you think of Basque country, you may be forgiven for thinking of tingly white Txacoli poured from great heights in the bars of San Sebastian. But there is a part of Rioja, near the Cantabrian mountains, that is also part of the Basque country. 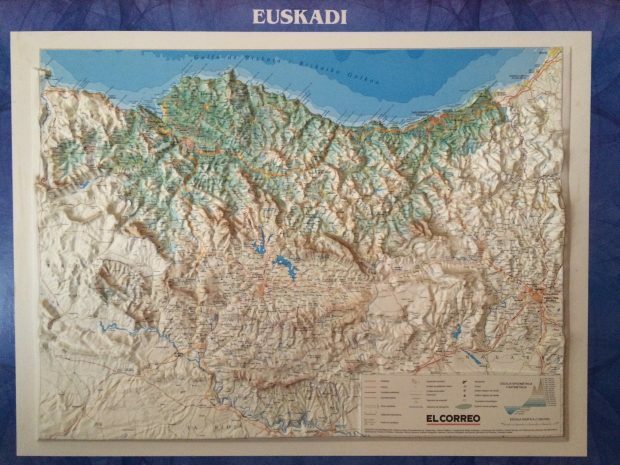 What did the Level 3 WSET book have to say about the Basque part of Rioja? “Rioja Alavesa is situated to the west of Logroño, on the north bank of the Ebro. Vineyards are planted up to 800 metres into the foothills of the Cantabrian Mountains. The soil is very chalky and the wines are perhaps the lightest of Rioja, but have the most finesse” (Wines and Spirits, Understanding Quality, WSET, 2012). And that’s it… Nothing about Vasco Pais, Euskadi, Basque Country. And about half as much information than for Rioja Alta and Rioja Baja. And yet, you may know the wines from here: Ostatu, Remelluri, Artadi, and Vega Sicilia vineyards. You can find them in the wine shop under the big sign: RIOJA. I just did not know they were from the Basque part of Rioja. What did it matter that the wines were from Basque country or not? On the journey of wine, this is the point where some wine lovers part ways. Either you are happy with the broad brushstrokes of ‘Rioja’, or you want to know more about where it comes from. Rioja Alavesa is not only is a different style of wine, a different place. And after visiting there, I’d also say, it is a state of mind. There is a tension between Rioja Alavesa and the rest of Rioja, overstated by the sub-editor in The Telegraph, “Rioja war as Basque vintners launch bid for independence”. Much as there is a tension, I would not go so far as to use the word, “war”. It’s not unusual for wineries to want to delineate their sub-regions. Aside from the stack ’em high, sell ’em cheap world of wine, the customer demands to know more about where a wine comes from: what makes the particular area unique? Especially, if they are paying more for a bottle. For customers, Rioja has a fundamental problem: no consistency of style – despite the strict regulations on the amount of time in barrel on the winery side (joven, crianza, reserva, gran reserva etc). People know the over-oaked, vanilla bomb that tastes like baked plums. In fact, Rioja has a natural higher acidity from the Tempranillo grape. In the glass, compared to the customer’s memory, they are different wines. Despite this, Rioja is one of the most recognisable wine brands in the UK. It’s right up there with Argentinian Malbec or New Zealand Sauvignon Blanc. This amount of recognition is an advantage for any wine region. Yet, Rioja Alavesa is not always the “Rioja” customers are asking for. What is Rioja? Is it the blocky Gran Reservas, the old oxidative styles of Vina Tondonia, or the gold-net styles found on the top shelf at the local shop? Wines from Rioja Alavesa have a clear sense of place. The ground here is calcareous clay; across the Ebro, it is iron based. The ridge of Cantabrian mountains stop the Atlantic winds and rain from the coast. The wet weather in Bilbao stops when crossing the mountains, and the land is dry and hot. People here work on a small scale and press the grapes near the vineyards – there is a return to the ways of their grandparents. The oldest winery has been found in the main town, Laguardia, working since before Roman times. A hop, skip and jump from Rioja Alavesa – in Bilbao – we stood at a bar before the flight home. Dazzled by colourful Pinxtos and good wine, what is clear is this part of the world knows the art of drinking and eating. The wines of Rioja Alavesa are perfect for the way we like to eat now. 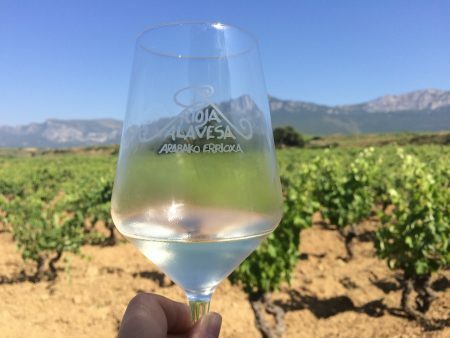 Does Alavesa need to break away from Rioja to get the recognition they deserve? Without echoing too much of the Brexit Remain argument, if some small changes can get through the bureaucracy of the Rioja wine board, arguably, it could make a big difference – more recognition of the sub-region on the label, for example. Anything is possible. A lesson learned from Brexit? Hear, listen. * I was in Rioja Alavesa to give a speech on the UK market and social media at a conference in Rioja Alavesa: “Challenges of winemaking: Survival and Evolution.” 8 July 2016, organised by Gerente de la Asociación de Bodegas de Rioja Alavesa (ABRA).